With the temperature on the rise and the sun finally breaking through the clouds, we can’t wait to go outside and get some Vitamin D. For avid gardeners, now is the time to tend to plants and grow fruits and vegetables in the backyard. The sun shines bright yet its rays are not harsh. The current weather is just perfect for gardening. But if you don’t want to do something so extensive like growing vegetables on a patch of lawn but are equally passionate about gardening, a dash of green inside the house can also enliven the living space with colour and fragrance. 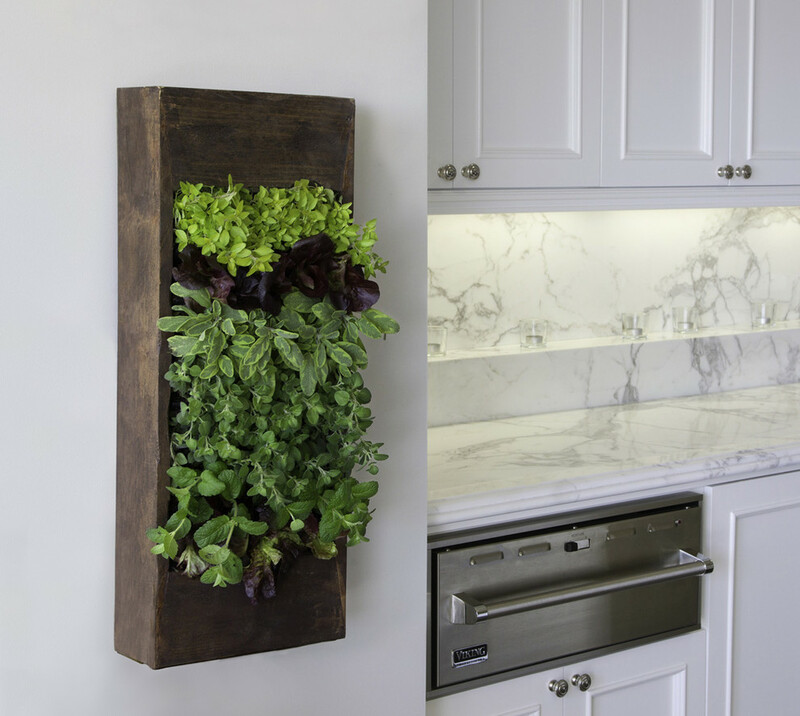 Yes, we are talking about indoor kitchen gardening. Have limited space? That’s okay. The window sill always has enough space to place artefacts or décor accents. That’s why pots and boxes are excellent options for sprucing up the kitchen space. Nutritious plants such as lettuce can be easily grown in such containers. Depending on the décor of your kitchen, you can either buy ceramic pots in monotones or repurpose wooden boxes and paint them yourself. PVC pipes also offer a simple way out to create an in-window planter. What do you think? Have you heard of the statement: “killing two birds with one stone”? Decorating the kitchen wall with a shelf or a mason jar is similar to that. How? 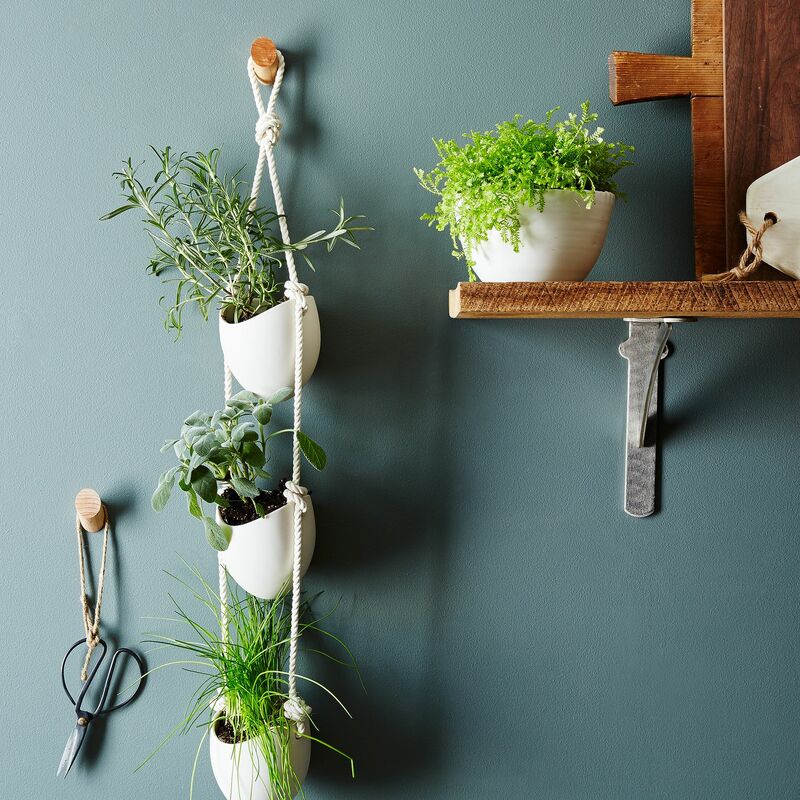 Purchase tiny shelves to grow herbs in them, and then place those shelves on the wall. If you are into glass containers, then hang them from the ceiling near the window so that they are not devoid of sunlight. Here, you are not only saving space but also doing what you love the most i.e. gardening. Check out this photo below; look how beautiful the indoor kitchen garden looks. Gardening can be an expensive hobby depending upon the kinds of plants you grow, the containers you use, etc. Don’t go overboard with the expenses. 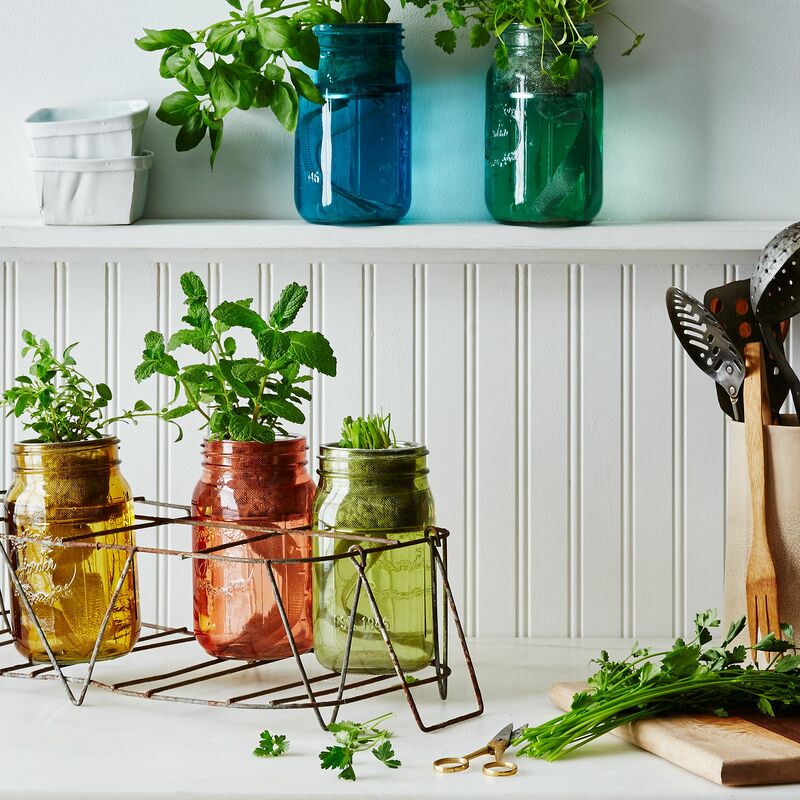 Repurpose wooden boxes or containers to grow herbs. The good thing you can change their placement as and when required. If you are unsure about well you will manage this activity, then start with a tiny garden and scale up the number of plants accordingly. If you get the hang of it, then there’s no stopping you. For starters, try setting up a simple salad garden. Lettuce, thyme, parsley, cilantro, rosemary and celery can be easily nurtured inside your kitchen. These culinary plants are also easy to maintain. For instance, watering them regularly is not a hassle. At least, once they have matured. While these herbs are growing, you will have to schedule a time in the day to water them regularly. But once the plants mature, an inch of water per week is more than enough for them to sustain. So if you plan to go on a long vacation in the future, these herbs will be able to sustain on their own for a while. Whether it is inside the kitchen or on the terrace, make sure wherever you place the pots or wooden boxes or shelves, that spot receives ample sunlight for at least 6 hours in a day and the soil soaks in the water properly. 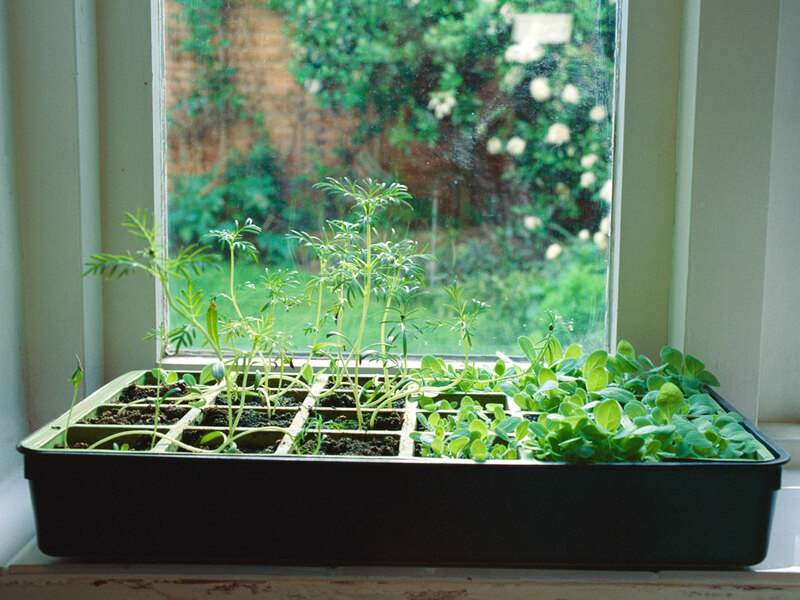 Inside the house, please place plants by a south-facing window. You can even fix additional lights inside the kitchen, just in case it is a little cloudy outside. There is hard work involved in the initial stages when the plants are growing but once they reach a certain stage, the maintenance requires little hard work. Just like a regular garden, maintaining a kitchen garden requires time and most importantly, commitment. Therefore, we would advise you to do your research well before taking a plunge into this type of gardening. Need help in setting up your kitchen garden? Our renowned global interiors can help you easily. Get in touch with us today!